When it comes to meeting the needs of divers, few dive centers can compare to Ventura Dive & Sport. 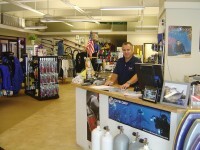 With 25 years of business experience and a staff of certified instructors, we can use our experience to ensure that you and your family receive the very best in diver training and also guide you in selecting your personal dive equipment from our incredible selection of name brands. Our on-site heated pool, along with our state-of-the-art classroom and flexible schedule make learning to dive very convenient. Our well-stocked rental department and repair facility are also at your disposal. Let’s go diving!